Get naturally beautiful hair- Nobody likes lackluster or thinning hair. But that's where Mom & World comes in! Filled to the brim with incredible, pure oils and ingredients Mom & World Hair Strengthening Conditioner gives your hair and scalp the nutrition it needs to heal itself. The hair strengthening formula contains hydrolyzed wheat protein, hydrolyzed silk protein, copper tripeptides, vitamins E, B5, golden jojoba, extra virgin olive, almond, castor, grapeseed oils and more to give your hair that extra oomph you've been looking for. These all work together to give your hair the vitamins, minerals, and proteins it needs to look its best. 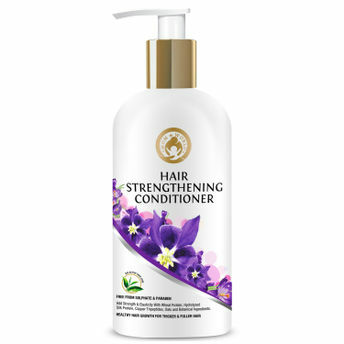 This conditioner restores, moisturises, strengthens and cleanses hair in one easy step. The proven formula of natural nourishing oils, vitamins and botanicals is moisturising and volumising and includes a blend of cold pressed and organic oils. Application is a simple as your old conditioner, but with remarkably great results.